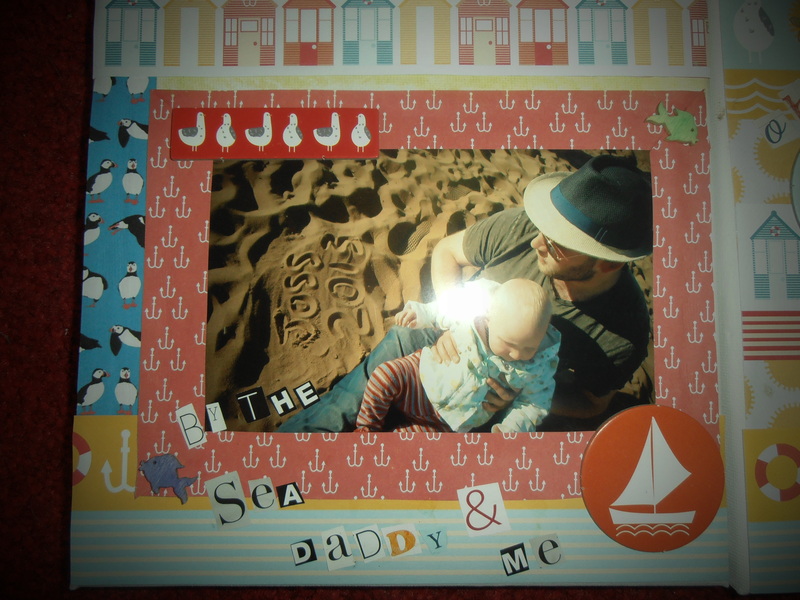 I recently had a guest post with Mumsdays where I made some flower collages with Joss. This weekend I expanded this into other flower collages, this one was my favourite. Joss loves to help out in the kitchen and I looked for a little apron but didn’t like all the plastic ones we saw. Eventually I spotted an adult apron in Poundland and liked the sweet ditsy flowers so this was a cut and stitch job waiting to happen! Upcycling From adult to toddler size is easy, if you want to do the same just chop off the bottom and either use to make a pocket or save for a hairband or other project. Then chop the sides saving the ties (I used a dress of hers for basic measurements for length and width) then I cut off the neck tie and repositioned a couple of inches closer together and stitched up all the hems finally repositioning the waist ties after she tried it on to give a comfy fit. 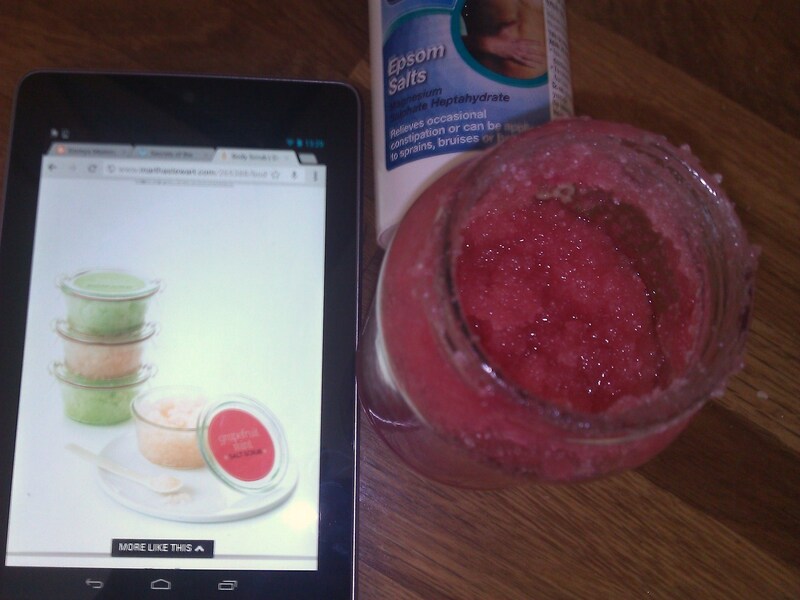 Cute and thrifty in less than an hour! This week has been more relaxed but relaxing myself if something I find hard so I took to crafting again as I like to have busy hands to keep a busy mind calm! We’ve also been potty training but more on that later! You can make this little button heart in less than half an hour with some fine craft wire and an assortment of buttons. Just thread your buttons onto the wire one after the other gently bending the wire to get the buttons to sit close to each other, then when you have a long line of say eighteen buttons bend the ends of the wire together to form a circle, then bend into a heart shape and keep moulding the wires til you’re happy with it. add a ribbon and admire your handiwork. This works really well with little crystal buttons or a mix of crystal and silver too! This week I have been joining in with some comment linky groups and have come across some lovely new (to me) blogs in doing so. I have also been working on my photography, still not great but I thought I’d share some of the things I’ve been trying here with my five photo tips for fellow non artistic bloggers! 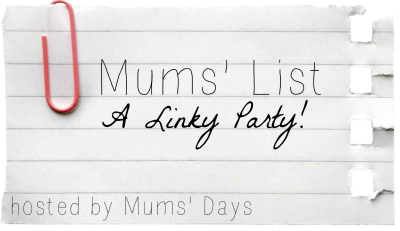 I came across Keri-Ann’s blog through a blog comment linky Gingerlillytea is pure whimsy and gorgeousness you must stop by with a cuppa and have a good old read! I am also hugely inspired by this pin and am looking at creating something similar in our little space! I made some of these little lavender bags as a gift for my Mam; I’d booked a massage for her birthday and wanted her to have something relaxing to unwrap as I don’t like giving a gift token as a gift with nothing else, must be related to my wrapping paper obsession! These are really easy to make up, if you have your own lavender plant as I do harvest the heads as they are drying at the end of their season, bundle and hang them together and then when they’re dry take the husks and store them in a dry place until you’re ready to use them. Stitch together two scraps of complementary fabrics insides facing, I liked a summery deckchair stripe, leaving a small gap to turn the right way round through, then fill with lavender and hand stitch the gap closed. So satisfying seeing something from your own garden brought back to life! I’m finding that it’s all very well and good having this free time to relax and get involved in some crafting but there’s really not much that I ‘need’ to make at the moment, we’re stocked up with birthday cards and the likes so I decided to turn my hand to making some birthday gifts. This little framed mixed-medium picture was thrifty and fun to make. 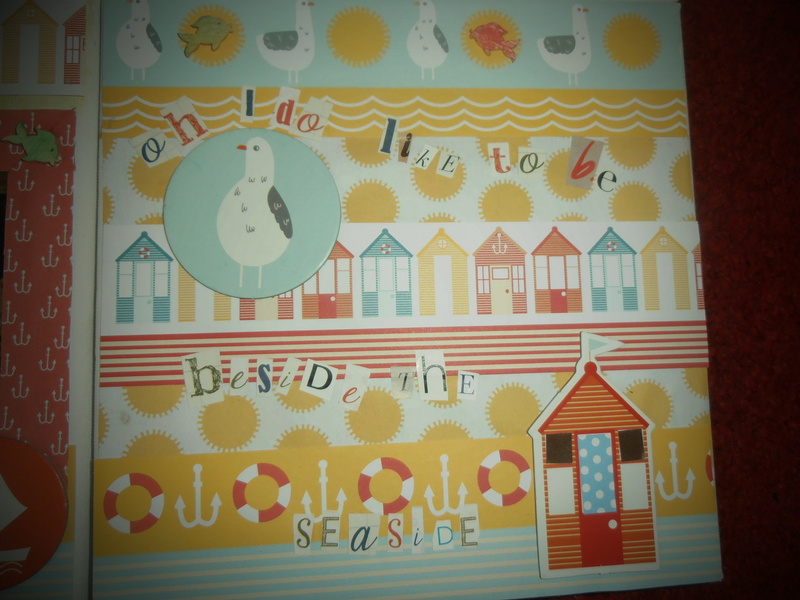 Perfect for a toddler or young child’s room I hope that its recipient will like it! If you’d like to make one yourself I suggest checking out charity shops for a similar embroidery hoop, I think they make really sweet frames for these fabric pictures, painted or plain they look good with a ribbon to hang them! I started with an embroidery hoop (50p in a charity shop), some twine and little buttons and a selection of fabrics from my own stash, my sewing machine, but you can do much of it by hand, and some red project paint left over from this project. I had the little squirrel iron on patch from a set from H&M that I bought to decorate some plain t-shirts for Joss, so this one cost about 40p. I selected this bright yellow flower print base fabric as it is pretty robust. I drew around the outside of my hoop to give a guide for cutting the excess fabric, then drew around the centre piece to mark out the workspace I will be adding embellishment to. Then I laid out my various bits and bobs to go apply to it as I went along. I decided on bunting and flowers with the woodland squirrel as these are pretty safe toddler themes, and as I prefer brights for a little one’s room I went with blues and reds to complement the yellow. I cut a cardboard triangle to use as a template for my bunting flags, drew around it and cut out seven flags. I made a fabric yo yo as a flower embellishment, I love yoyos, they’re very simple. There’s a great tutorial here, but basically you cut a circle of fabric and leaving a long tail of thread as you start fold and tack a quarter of an inch under on the wrong side of the fabric as you go with a needle and thread, once you reach where you started hold both ends of the thread and pull tightly to gather the fabric, then knot the ends of the thread and neaten with scissors leaving as it is or in my case adding a small red fabric heart to cover the hole where the yo yo fabric gathers in the middle. I cut fabric hearts and fabric flower shapes by cutting more circles and then cutting out notches to form petals, layering where I fancied and adding button centres to add interest, I decided to glue some in place and stitch others to add to the homespun effect. Finally I ironed my little squirrel motif in place. I painted the frame red and as I didn’t have ribbon I crocheted a strand of single crochet to add a loop to hang up the frame (I am a great believer in using what you have to hand)! My craft space is coming along nicely and I was telling a friend about it this week, she said she’s always wanted to do something crafty but doesn’t know where to get started. I thought I’d blog about how I fit crafty activities into my daily life, something I managed to do with a newborn, whilst studying and now whilst working and parenting, as it’s important to me to do something that I find relaxing, productive, fun and that brings some colour into my life! Look at craft literature, magazines are great, they often come with a project inside, like this month’s Homemaker. I made this cushion using materials that came with the magazine, Joss loves it, I got loads of inspiration from the book and learned a new skill, soft toy making! Better still, visit your local library, many have a craft section and with a photocopier on site to copy and enlarge any patterns you may find a gem! You’d be surprised how a small project works up pretty quickly with even just ten to fifteen minutes a day, and by how relaxing picking up a project can be! This is a longer term work in progress of mine, the crochet blanket in the background, so far I’ve put about three hours in over many days, it’s so colourful it’s a joy to return to after a busy afternoon with Joss! What craft would you like to try and why? Or if you’re yet to dip your toe in the water what’s stopping you? 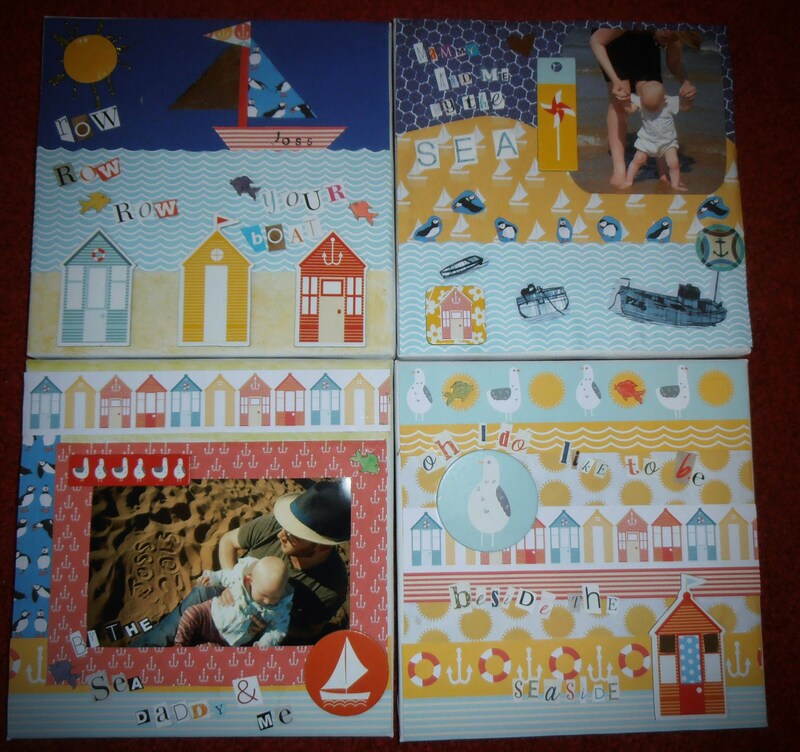 I finished Joss’ 4 canvases today, all with a seaside theme and incorporating photos from her first trip to the coast at South Shields and her first dip in the sea. Bargain canvases at £4 for 4 and a craft magazine with all the trimmings made this a really cheap and easy activity, kept me busy for a few nights and will make a pretty display in Joss’ room!